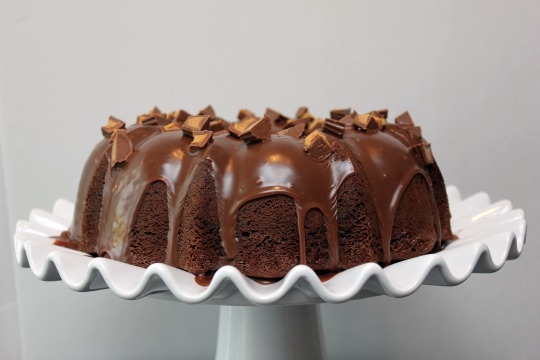 I like Chocolate Peanut Butter Bundt and I can not lie. Okay - sorry about that, but I just couldn't resist. I haven't made a bundt cake forever. My mom used to make them a lot, especially on Sunday. her cakes with icing drizzled all over it. Anyway - for some reason I felt like breaking out my bundt pan and chocolate with peanut butter is always a good combination, so I made Chocolate Peanut Butter Bundt cake. Now go find your bundt pan and make some cake! In a large mixing bowl, mix all of the cake ingredients together, except for the Reeses cups. Pour half of the batter into a bundt pan sprayed with cooking spray. Layer Reese cups all over the batter. Top with the rest of the batter and bake in a 350 degree oven for about 45 minutes or until toothpick inserted comes out clean. Cool cake on a wire rack for 10 minutes. Invert onto a serving plate to cool some more. In a saucepan over medium low heat, combine the sweetened condensed milk and chocolate chips. Stir constantly until the chips are melted and the mixture is smooth. Do NOT allow it to bubble. Remove from heat and stir in vanilla. Cool slightly before drizzling over cake. After glaze has cooled a little more, sprinle chopped Reeses cups on top. Note - this makes ALOT of glaze. I only used about half. Use the rest to serve over ice cream or other dessert. What are the directions for cooking the cake? I didn't see instructions for that, just the glaze. Sorry Amy - I just added them.